In the Cardinal's statements, we basically have an affirmation of a fundamental thesis of Michael Davies and most Traditionalists: that the Council documents themselves have ambiguities in them and are subject to a multitude of interpretations. This concept of Conciliar ambiguity has been denied by many conservative/pop apologists, who insist that the Council documents are plain as day and it is only the malice of dissenters pushing a false implementation that is responsible for our current confusion. Traditionalists, however, and ironically, Kasper, too, have insisted, however, that the destruction that followed the Council can be read back into the documents themselves. Even if the Council Fathers did not intend for the disaster that followed the Council (and most agree they did not), the documents themselves were constructed in such a way as to permit progressive interpretations when put into the hands of progressive theologians or bishops. Contra the conservative mantra of "perfect documents - imperfect implementation", Kasper affirms the Traditionalist critique of "imperfect documents lead to imperfect implementation." Benedict XVI had made the same point. There is an intimate connection between the documents and their implementation. But Kasper does more than just admit that "the conciliar texts themselves have a huge potential for conflict"; he goes on to state that these ambiguities, these potential conflicts, were part of an intentional program. He does not simply say the texts will bear various interpretations, but that these ambiguous passages were "compromise formulas" brought forth to placate two opposing sides, in such a way that they can be interpreted in an orthodox manner, but just as easily can be twisted by the progressives to lend seeming support to their mischief. These are what the late Michael Davies called the "timebombs" in the conciliar texts. Davies wrote, "These 'timebombs' were ambiguous passages inserted into the official documents by the liberal periti or experts - passages which would be interpreted in an untraditional, progressivist sense after the Council closed." (Michael Davies, Liturgical Timebombs, Rockford, Ill: Tan Books, 2004, pg. 23). Davies borrowed the phrase "timebombs" from Archbishop Lefebvre's book A Bishop Speaks, which had basically put forward the same argument. In Kasper's interview, we have nothing less than an admission that there were not only timebombs, but that they were placed there intentionally, and in this he and Lefebvre are in agreement. This is a stunning admission. This is contra to the prevailing mantra from the JPII era that we are experiencing a 'new springtime" and a candid admission that there is in fact a crisis, despite the fact that some, such as Cardinal Timothy Dolan, continue to deny this plain truth. This simple admission of fact, that the Church is in crisis and is not experiencing the promised post-conciliar springtime, is of considerable importance in moving forward, and whatever else we may think of Kasper, I appreciate his sincerity here. "For those who know the story of the twenty councils recognized as ecumenical, this [the state of confusion] will not be a surprise. The post-conciliar times were almost always turbulent. The [Second] Vatican, however, is a special case." This important admission, which I have also stated elsewhere, really debunks the conservative Catholic talking-point that what we are experiencing in the modern Church is normal, since there is 'always confusion after a Council.' That may be true, but Kasper notes that the confusion that followed Vatican II is "a special case", different from the turbulence of previous periods. This, too, is a point that is often made by Traditionalists, who see in the Second Vatican Council not just another ecclesial event with the standard level of confusion after the fact, but rather a new kind of ecclesial event that cannot be so easily classed alongside the Councils of the past. Cardinal Kasper affirms the positions of Michael Davies, Lefebvre and the Traditionalists? These are strange times, indeed. There is a paraphrase of Kasper's comments here, or you can read the original through Google translate at this blog. As of yet, the L'Osservatore Romano Englsih site has not posted the articles from the previous week, but I will link it up when it becomes available. Like this article? Please follow us on Facebook or consider subscribing to this blog! How is Vatican II "a special case"? The precipitous decline in everything (baptisms, conversions, priestly vocations, etc.) occurred beginning in the mid-'60s. Wow! This is great. If more mainstream bishops could say this it would help the Church a lot. Up until a few years ago it was heresy to even suppose that we aren't in a new springtime. Not much to add except that this is encouraging. God Bless. Many say we should not be surprised at the confusion that has been part of the Church's life for the past forty years, because periods of confusion always follow ecumenical councils. Therefore, we can be confident that this mess will eventually sort itself out as part of the regular process of implementation that follows in the wake of a Council. Kasper, however, says that this is not the case - that even though there is always confusion after a Council, Vatican II is not like the other Councils, and the disputes and confusion that have come in the wake of V2 are very much unlike the controversies that came after, say, Nicaea or Chalcedon. I agree with him on this point. It was an event that has no precedent. Most have read the stats where 75% of Catholics attended Mass before VII and now we have something closer to 10%. Then consider that most of that 10% is out the door before the final hymn finishes whilst having received the Eucharist and we realise the scale of apostasy. What comes to mind is then Cardinal Pacelli's Fatima warning of the suicide of altering the faith in its "liturgy, theology and soul" which has come to pass. The good Cardinal is being a little unhistorical here. There is no evidence that I am aware of that "every" Council had confusion left in its wake. That is a gross error. If he has the evidence to support such a remark let him offer it. Otherwise he should refrain from making such statements. In any case, I would imagine 40+ years is long enough to examine dispassionately the aftermath of this last Council. And yet Pope Francis recently stated that the Moslems worship the same God as we do, even though they do not worship The Blessed Trinity, Father, Son, and Holy Spirit. Boniface has it right, but I'd take it further. Previous councils pronounced dogmas and doctrines. Therefore, whatever chaos ensued generally took place between Catholics and easily identifiable heretics. Either you believe Christ was begotten not made or not. Either you believe transubstantiation or not. Vatican II pronounced no new dogmas, and the documents are ambiguous enough to permit several competing interpretations. The chaos of the last fifty years has all been between Catholics who are officially in good canonical standing. So what is to be done? Can the Geni be truly put back into the bottle? Even if a Pope were to openly refute VII, retract it and outlaw it along with the rank catastrophic stripping of all elements of church life and teaching from architecture to catechesis to liturgy, to Catholic Christian art, to the vocations, to sacred music, to true, Godly sacred beauty, to questions of inter-personal ethics/behaviours that would have simply not been tolerated 55 years ago or so, and the butcher's bill keeps on going in the wake of disgraceful implementation (not going to happen without direct and miraculous Divine intervention), the documents have been circulating for nearly half a century, exist in a multitude of formats (hard-copy and electronic), and, for the mostpart, the vast majority would outright ignore such a retraction or ban. If the train has derailed, how can we as ordinary parishioners out there in the burbs (often in liturgical wildernesses who simply cannot drive the two hours one way to go to a TLM due to no drivers' licence etc) truly enact Godly orthodox change if we are lone voices in our parishes etc or have to endure liberal priests who SHOULD know better? many on the 'liberal' side of the equation have cried for a 'third Vatican Council' for years because they believe that VII is now redundant, due to the unbelievable shift in social mores and moral/ethical accepted behaviours even by the vast majority of weekly, church-going pew-sitters, so even if a VIII were to be held, the chances are very very high that it too would be hijacked to serve the heterodox ajenda. Despair is so easy to fall into in these dark, dark times where good is evil, and evil is good, where truth is slavery and the tyranny of relativism is truth, where exposure, licence and indecency are freedom whilst modesty, maturity, and decency are relics of a bygone age destroyed by the boomers unleashed by their early-mid 20th century handlers/enablers who have wrecked it for everyone else!!! Its all well and good for Card. Kasper to cry into his cups after the fact...too late, brother...too late. What is to become of the torn, frayed and devoluted shell that was once clearly visible as Holy Mother Church and not a 'we can be better hippies then the hippies' wackos, infantiles who are in love with their Marty Hougan, clown masses, pantsuits and blue rince buz cuts, while all is love, love love as souls starve to death in quiet desperation? While not every Council has had "confusion", most have had controversy, but as Beefy said, the side in the controversies were easily distinguishable. There were controversies after all of the first seven councils. I think the councils of the high middle ages were rather uncontroversial, but there was a ton of controversy, confusion and dissension following Constance and Florence-Ferrara. Trent was in the midst of one of the worst periods of crisis in the Church, and Vatican I resulted in a schism with the Old Catholics. So, yes, there has usually been controversy and confusion, but not for the same reasons as after Vatican II. But why is he admitting this now? That's what I don't understand. I've read some of his other remarks from the same article, and all I can think is that maybe he's trying to lay the blame for the crisis on traditionalists who fought the "reforms" instead of going along with the program. If anything else makes sense, please tell me. 1 It is not a requirement for a Council to be valid that it be specially inspired. Christ gave the authority for the Hierarchy to have one when they decide it's a thing to do. The same Pope made a deal with the Soviets not to criticism communism or any communist country in exchange for sending Russian Orth. observers. THIS EFFECTIVELY PREVENTED THE CONSECRATION OF RUSSIA BY THE POPE AND ENTIRE HIERARCHY TO THE IMMACULATE HEART OF MARY! And how ironic because the entire acting hierarchy WAS IN ONE CHURCH BUILDING FOR 8 WEEKS OF FALL FOR FOUR YEARS!The same Pope bannished the 3rd Secret for 40 yrs.OF COURSE, THIS COUNCIL WAS NOT INSPIRED BY THE HOLY SPIRIT.Ambuiguity that is deliberate is called by another name sometimes called CONFUSION. iT IS THE FIRST TACTIC OF THE ENEMY CALLED SATAN. Some good things came from this Council and some implementations were also good. But now we can not even get the Vatican to clear up the ambiguities so as to assure a Catholic interpretation which removes a WORLDLY one. Meanwhile the world situation has moved on. Soon as prophecy in the Church, ancient and new will make it moot, as humongous changes of Tribulation, persecution,Warning, Miracles, Chastisement start to happen. In the Era of Peace promised by Fatima,no demons or unconverted people will be around and 2/3rds of the human race will be gone, with great changes in the physical planet a done deal. The Church did not begin in 1963. When I read how Rome wants to celebrate Luther's 500 year-old satanic severing of Christianity, it occurs to me how much, in theory, but without The arch-heretic's honesty, they have in common with him. In promoting an entirely foreign theology, Luther was bold and ready to die a madman's martydom, the council architects believed similarly, but instead used sophistry, the first tool of all cowards. In promulgating this new "pastoral" theology, Luther sought to convince, but the "pastoral" council colluders used intimidation and calumny to demonize those who would draw from 2000 yeatrs of The Faith to interrogate 1960' era neo-modernism and ecumania. Luther wanted to call every man to think for himself, but every subsequent Roman administration, with the repentant-liberal Benedict "reforming the reform" and straining to find a "hermenuetic of continuity" left to the side for a moment, looked for no "dialogue" with those who questioned charitably, but instead promulgated a cult of papal adoration that could only be asserted post-council. It is, ironically, the fear of every protestant, that Catholics adore the papacy. The Papacy, the Petrine Office, is a responsibility. It is not a coronation of one's previous undertakings. It is to take personal responsibility, before The Most High, of the Catholic flock firstly. If Peter does not protect and feed the sheep and lambs, he can quickly become the "Satan" the Lord re-directs, the crowd-pleaser St. Paul admonishes, or qualify for all the "Woes" the Lord curses the self-righteous style-over-substance pharisees and scribes over. The Church must repent. Firstly, for not obeying Our Lady in 1960, then for the "Devastated Vineyards" of the last 50 years, and finally for an obstinancy that makes the Apocalypse's suggestion of the final reckoning of the "city on the seven hills" seem all the more believable..VIVA CHRISTA REY!!! Why do people not use the 'Enter' button? I never read it anymore. I discovered very quickly in the past that those who can't use the 'Enter' button and rant on never have anything interesting to say. Any legislation or committee document is a subject of negotiation and compromise language. That's hardly news here. We have an authoritative magisterium whose authority it is to interpret any such ambiguities in the Council document, and one should do so in an orthodox fashion according to an hermeneutic of reform in continuity, as Pope Benedict said. Just get on with it and stop whinging. This is why the Magisterium has not stepped forward to interpret much of these statements, and the statements they have made have been generally ignored by the Church at large. Dear Charles S. The rupturists who have tried to claim continuity have been rhetorically denuded by this admission. The Magisterium is nekkid and yet it INSISTS that the faithful adhere with religious submission of minds to THIS captious collection of compromise which IS NOT in continuity with Tradition? This Ecumenical Council was sui generis in that it was a Pastoral Council which did not produce any Canons or Decrees to which the Cardinals and Bishops at the Council had to accept as official Doctrine of The Catholic Church or have the guillotine of anathema dropped on their heads. In fact, a not insignificant number of Bishops participating in the Council voted to REJECT one or more of the Documents and yet they left the Council FULLY in communion with the Pope and the Catholic Church. Pope Paul VI and the Council did to The Catholic Church what Bomber Harris and his boys did to Dresden. True, although the fact that the Council was pastoral in nature does not detract from the authority of its documents. Just wanted to make that clear. The Magisterium can resolve these disputes but they have largely declined to do so for whatever reason. It took them what, forty years or so to resolve the confusion about "subsists in" from LG? A "pastoral" Council addressing no pressing heresy is like an "open" "loving" marriage professing fidelity to a spouse. Among the many errors of patron saint of V-2, Cardinal Hans Urs Von Balthasar, (including the "Hell exists, but no one's there.." canard and the "Jesus wandered around cluelessly most of his life, until HE finally figured out who HE was and what exactly HE was supposed to do.." delusion) was the one, where the continually adored Cardinal, feted still by the professional Catholic Establishment, even today, says that The Roman Catholic Church, the Spouse of Christ, has always been a whore. You now understand the reasons why concilliarists see no good reason for every soul to die a good Catholic. Balthasar's wrong, unless, of course, he's talking about the whoring hearts of V-2 "periti" like Rahner, Kung, and himself. Please run away from Robert Baron's deceptively titled, "Catholicism" (who inculcates the aforementioned drivel), and to Michael Voris's outstanding "ChurchMilitanttv.com"
I read the article but I did not see any actual examples of ambiguous statements in the documents of Vatican II? Without them, how can we get a handle on whether they led to confusion or conflict or were "timebombs"? Cardinal Walter Kaspar uses wild interpretations of Church texts and makes claims with no supporting text in the Council.He has received an award from the Jewish Left for his important contribution( to the making of a Zionist Catholic Church). Recently in a report in the L'Osservatore Romano he has said there can be two interpretations of Vatican Council II.This is nonsense.If there can be an interpretation contrary to Tradition there can be numerous interpretations depending on one's fancy. He wrote that Pope Pius XII corrected the rigorist interpretation of Fr.Leonard Feeney in the Letter of the Holy Office 1949. This is false. Where does the Letter say that Fr.Leonard Feeney was excommunicated for heresy instead of disobedience? Where does the Letter say that invincible ignorance and the baptism of desire are physically visible to to us and so is an exception to the traditional teaching on other religions and salvation ? The text does not say all this.He just takes it for granted and assumes it does. This is not just the fault of the liberals like Cardinal Kaspar but also of the traditionalists like the SSPX and the sedevacantists.They also support Cardinal Kaspar in the interpretation of the Council. The Council cannot have two interpretations. It is contrary to the Principle of Non Contradiction.We cannot say every one needs to enter the Church for salvation and at the same time say there are known cases who do not have to convert into the Catholic Church. Cardinal Kaspar, the SSPX and sedevacantists commit this error. They assume that Lumen Gentium 16,(invincible ignorance) Lumen Gentium 8 (elements of sanctification) etc are not invisible. For them these cases are actually physically visible to us on earth. They allegedly personally know such cases in 2013; visible ghosts. These dead men walking are implied to be exceptions to Tradition; to the dogma on salvation and the Syllabus of Errors. Based on this irrationality they have a new interpretation of Vatican Council II which is a break with the past.So they say there are two interpretations of the Council . One is with the visible dead premise and other without it. This irrationality is the basis for Cardinal Kaspar's new theology and it is the only interpretation of the Council that the SSPX seems to understand. For the sake of honesty and integrity, you ought to round out your list of V-2 periti. You are missing a big name or two. Even if one of them may be mighty uncomfortable. 1)Von Balthasar thought Jesus didn't know who he was for most of his life? Seriously? How was this guy not considered a heretic? 2)Might have misread what you wrote, but what's this about the Church being a whore? 3)You said:Please run away from Robert Baron's deceptively titled, "Catholicism"
Did you mean his blog, Word on Fire, or did you mean his 10 part series ("Catholicism"), or all of the above. I ask because I just bought his 10 part series not that long ago, saw an episode or two on EWTN and liked it, so I picked it up. Is there something I should know about the series before I open it up (and thus am unable to return it afterwards)? In light of the recent disclosure of intention ambiguities in the vcii language , that the council was pastoral – i.e. a possibility of some error, but we’re to interpret this ambiguous language in light of tradition, even though we’re told we were in the new springtime in the church, but our prelates to this day cannot define what the true meaning of the council was, has left me confused as ever, as our church does not know where this council stands except to say it was legitimate . It does make me appreciate the sspx and how they’ve persevered with their criticisms . Please see my lecture below: Was God Behind the Ambiguities of Vatican II? recorded in 2005. There you will find a better reason than Cardinal Kasper’s as to why Vatican II, which was led by the Holy Spirit just as the twenty councils before it, was divinely permitted to contain ambiguities. It is much deeper than what Cardinal Kasper is revealing. God allowed the ambiguities as a judgment against the Church for her sins. Understandable but how can the Holy Spirit teach a factual error ? On the issue of other religions and ecumenism how could God make the present day objective error ? How could God say that we can see the dead, we can name those non Catholics in Heaven saved with the baptism of desire or invincible ignorance, how can God say that those saved with 'elements of sanctification' are visible to the physical eye ? Yet this is what the liberals and traditionalists are saying and so for them there are known exceptions to the dogma extra ecclesiam nulla salus and so Vatican Council II is a break with the past. In a series of talks on the subject No Salvation Outside the Church available on Youtube Robert Sungenis has also said that every one needs to enter the Church except for those in invincible ignorance and the baptism of desire. Except for these cases? Do we know any of these cases in 2013? Does any Magisterial text say that we know any of these cases ? Why do they have to be mentioned as exceptions? So on the issue of other religions and ecumenism there is no rational basis for any ambiguity and yet we see so much of it. So the fault is not with God it is with us. We just have to correct the irrationality and Vatican Council II is traditional on the issue of other religions and ecumenism. DID ARCHBISHOP MARCEL LEFEBVRE AND CARDINAL WALTER KASPAR USE THE SAME WRONG PREMISE IN INTERPRETING VATICAN COUNCIL II ? How can the Holy Spirit teach error,Pope Francis ? I have no idea what you keep speaking about the Church 'seeing the dead.' The Church has never affirmed that those who are saved by baptism of desire of blood are known with any certainty (except for certain saints, like St. Emeretiana). Nobody is claiming that we have knowledge of these things, and there is certainly no 'factual error' here since nobody is claiming that. All that has ever been taught is that baptism of desire is possible, that's it. Every single time you comment it is about this same topic, no matter what the post is about, which is why I usually do not publish your long, rambling posts. I read the Article, Cardinal Kasper's comments, I am as confused as I was when I read some of The Vatican II Documents, The Explanation of Vatican II The Explanation of the explanation. They are really walking in circles. The problem is that Muslims do not worship the same God as Catholics We KNOW this. Christ Created ONE Church (not 60,000 sifted like wheat) The Catholic Church, The Bride Of Christ. Christ is loyal to his Bride, he certainly did not say go cheat on her. He promised the Gates Of Hell will not prevail upon his Church. Just think when people are wrong, they say well, what I really meant was blah blah blah! I remember poor Pope Benedict XVI facing Mecca, or something like that, holding his cross as they all prayed together Ecumenism practiced like this is a joke. It is clear that Americanism has replaced Catholicism, or tried too, maybe the gig is up so to speak.But I do take issue with many so called Traditionalist, who certainly do not help, Many, not all, are guilty of extreme arrogance and resemble Mormons more then Catholics, there not so Christ like behavior is a huge turn off to many people. The serious lack of interest in the Catholic Faith is another problem because they go the Latin Mass that is enough, and will only associate with Catholics that attend there Mass, I think the worst Catholics I have met are ultra Liberal Catholics or Traditional they are the same. I think Pope Benedict put it best when he stated we must love The Bride Of Christ and HUMBLE ourselves that is hard. When I hear the all Religions are the same I truly shudder Its tragic. But my interpretation is that there is no Salvation outside The Catholic Church and you will have to accept The True Church of Christ in order to be saved. When you accept that salvation whether here in purgatory, I do not know. But with knowledge is responsibility. We have Catholic leaders who are placating Jews Muslims without even attempting to convert them. As long as they all show up at The UN which in my opinion is the Synagogue of Satan. "3)You said:Please run away from Robert Baron's deceptively titled, "Catholicism"
Unfortunately, Father Barron seems to agree with Von Balthasar in that he seems to doubt many, if any, are in Hell. That's a problem. I hate when someone steps off the path on something like that because I wonder if he's stepped off the path on that matter of faith (which is easy to see) are there other matters of faith that he also stepped off the path on (which may not be as easy to see but still...) Therefore, rightly or wrongly, I do not follow or support them anymore. So, as beautiful as the DVD series may be, I won't waste my time with it. There's too many totally orthodox writings out there to waste time with something I have to parse for its orthodoxy. Life's too short. Lynne, I don't personally believe Father Barron is all bad. He does take a very modern approach to certain theological problems, and his endorsement of Balthasar is problematic. Thanks for taking a crack at it, though! You should post your answer on the correct thread, though. There is ambiguity in Vatican Council II because of the use of a false premise and not because of the Council itself.Change the premise and the interpretation of Vatican Council II changes. On this blog I have cited numerous Catholics using a false premise and then assuming that the Council is liberal and ambiguous. I have also shown how if you correct the premise , Vatican Council II and the Letter of the Holy Office 1949 take on a new meaning.They are no more a break with the past. There cannot be ambiguity if Cardinal Luiz Ladaria S.J, Archbishop Gerhard Muller and Archbishop Augustine Di Noia do not assume the dead are visible to us. This is the irrational premise being used today by the Congregation for the Doctrine of the Faith cardinal and archbishops. It's probably unintentional. Something they have overlooked. This was my error also once upon a time.I am no apologist.I don't have academic degrees in theology, philosophy or Scripture.I keep saying I am no authority but of one thing I am dead sure, it is, we cannot see the dead. Unlike the CDF and the Vatican Curia Michael Voris on Church Militant TV understands. He got it right. He asked Fr.Jonathan Morris to name someone who does not need to enter the Catholic Church for salvation (1). 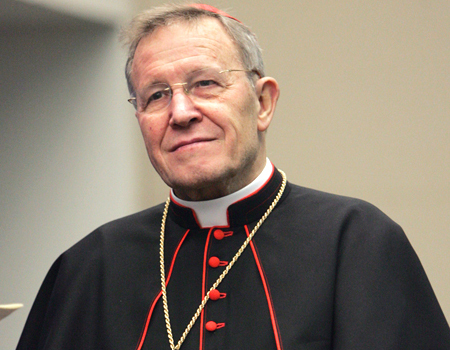 Similarly Cardinal Walter Kaspar cannot name any one saved in inculpable ignorance (LG 16), seeds of the Word (AG 11), imperfect communion with the Church (UR 3) and good and holy things in their religion (NA 2). Vatican Council II does not name any one saved. There is no one named who is saved and outside the church. Vatican Council II instead indicates that all need to be visible members of the Catholic Church for salvation, with visible Catholic Faith and visible to us baptism of desire. I suspect Cardinal Walter Kaspar knows all this.Otherwise he would have been quick to present some theology to refute what I have been writing over the years. This issue is shocking and disappointing for many liberals.They realize that the false premise was the cause of the ambiguity in Vatican Council II. They realize that if those saved in invincible ignorance and the baptism of desire are not visible to us then how on earth (no pun intended), can we meet or find an exception to the literal interpretation of extra ecclesiam nulla salus. We cannot see the dead! This is an objective observation, a fact of life. Recognize this premise and the ambiguity goes. Vatican Council II (AG 7) affirms extra ecclesiam nulla salus as it was interpreted for centuries. It's pro- St.Robert Bellarmine and the Jesuit missionaries. The Catechism of the Catholic Church (846) affirms extra ecclesiam nulla salus as it was interpreted for centuries. Lumen Gentium 16 is not an exception to extra ecclesiam nulla salus as it is commonly reported on the Internet. The liberals had been looking at those saved, 'exceptions',independently of the dogma on salvation.Then they also assumed that the 'exceptions' were known.Tradition shows us that 'the ordinary means of salvation' (Redemptoris Missio 55) is the Church, it is 'faith and baptism' (AG 7). The ordinary means of salvation is not the exceptions which we accept as only possibilities known only to God. We have Vatican Council II and the Catechism of the Catholic Church in agreement with Tradition on the issue of other religions and Christian communities/churches and there is no ambiguity here. Video : What Did he Just Say? Sure. I think everyone here agrees that, if someone is saved outside the Church, there is no way to point them out or say "Here's an example." That would be known to God alone. So as far as the living are concerned, everybody needs to enter the Church. And please stop leaving rambling messages that always say the exact same thing no matter which post you are commenting on. So is Vatican Council II traditional on the issue of other religions ? Does the Council say that all need to enter the Church for salvation in 2013? Or does it say there are exceptions? No, the Council doesn't specify everyone needs to enter the Church in 2013 because the Council happened in 1962-1965. Duh. Crusading, Homiletics, Mysticism and More on USC!